Get two tickets for $12 from LivingSocial. 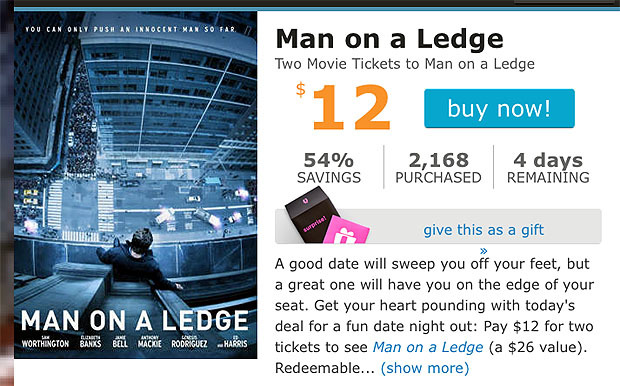 Limit one per purchaser, up to one additional as gifts • Limit one voucher per couple, per visit • Vouchers available 24-48 hours after your purchase is complete • Voucher must be redeemed online at www.movietickets.com • The deal is valid only for two “Man on a Ledge” movie tickets only and may not be exchanged or transferred • Entire value must be used in a single visit • Other conditions apply • PAID VALUE EXPIRES ON January 27, 2017 • PROMOTIONAL VALUE EXPIRES ON February 26, 2012. It is $5 a ticket at our theatre, so this wouldn’t help very much.